Grey Britain could prove best in what appears to be a trappy heat in the Betway Conditions Stakes at Lingfield. A case can be made for any of the five contenders, with all having a question mark of some kind ahead of this two-mile heat. For Grey Britain it is the trip that is the unknown factor as he has yet to race beyond a mile and a half - but the way he stayed on to win at Wolverhampton in December certainly offers some hope he will see out the distance. He won a decent handicap in clear-cut fashion that day, with a subsequent 6lb hike in the weights somewhat forcing John Ryan to raise his sights in terms of company. However, Grey Britain is certainly favoured under the conditions of this event, having upwards of a 2lb pull with each of his rivals and it will be a bit disappointing if he cannot make that advantage count whilst in fine heart. Key To Power should attract plenty of interest in the Play 4 To Score At Betway Novice Stakes as she returns from a lengthy lay off. Mark Johnston’s runner made just one start as a juvenile last year, finishing second to Queen Of Bermuda last May - form which has worked out very well with the winner going on to make her mark at Pattern level. Heavenly Tale changed hands for 140,000 guineas as a yearling and while she has taken some time to get to the track, the wait could be worth it in the Ladbrokes Novice Stakes. A daughter of Shamardal, she hails from the family of former top Far East campaigner Dan Excel and can make a winning start. Creationist looked sure to improve for his recent win and can build on that impression in Newcastle’s Ladbrokes Novice Stakes. He was a bit unlucky to bump into the well-regarded Set Piece on his initial outing and defied his odds of 33-1 to finish a close-up third. He stepped up on that to register a narrow victory at Kempton recently, but his inexperience was still evident in the race and he can take another leap forward for that outing here. Blame Culture let favourite-backers down last time out but can make amends in the sunracing.co.uk Handicap. He was only beaten half a length in third on that occasion and a similar effort off the same mark should see him feature in the finish again. 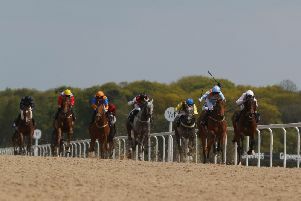 Geordielad seemingly thrived for a step up in trip when causing a 25-1 shock on his latest start and can go in again in the Betway Stayers’ Handicap at Wolverhampton. He had hardly set the world alight in three hurdles and five Flat outings but upped to a mile and six furlongs, Geordielad proved staying is his forte and a further switch to an extended two miles should be right up his street. Liva is the pick in the Racing To School Juvenile Hurdle at Catterick despite having been well held when second at Musselburgh on New Year’s Day, where a penalty weighed heavy against an unexposed Irish raider. Present Value’s initial second behind Al Dancer reads pretty well now and he can strike gold in the Faucets Introducing Intelligent Care From Rada/EBF “National Hunt” Novices’ Hurdle at Chepstow. He strolled home by seven lengths at this track on his latest outing and can defy a penalty. CATTERICK: 1.00 Liva, 1.35 Coole Well, 2.10 Cap Du Nord, 2.45 Strong Resemblance, 3.15 Tacenda, 3.45 Chain Of Beacons, 4.20 Dew Pond. CHEPSTOW: 1.20 Trigger Nichol, 1.55 Present Value, 2.30 Secret Reprieve, 3.05 La Coeur Net, 3.35 Radical Archie, 4.05 Greyed A, 4.35 Ask Himself. DUNDALK: 5.00 Stanhope, 5.30 Georgian Bay, 6.00 Kerosin, 6.30 Fairy Tango, 7.00 Royal Court, 7.30 Latchet, 8.00 Jered Maddox, 8.30 Lapilli. LINGFIELD: 1.45 Yusra, 2.20 Loyalty, 2.55 Heavenly Tale, 3.25 GREY BRITAIN (NAP), 3.55 Key To Power, 4.30 Fayez. NEWCASTLE: 4.15 Loud And Clear, 4.45 Creationist, 5.15 Cadeau D’Amour, 5.45 Porrima, 6.15 Blame Culture, 6.45 Orobas, 7.15 Wise Words, 7.45 Dodgy Bob. WOLVERHAMPTON: 1.30 Classy Cailin, 2.05 Gone With The Wind, 2.40 Battle Of Paradise, 3.10 Geordielad, 3.40 High Acclaim, 4.10 Greyzee.